DESPUB continues to improve its web sites, www.despub.com and www.churchmusic.biz. For the first time there are now items up in pdf files so you can view them on line. This has been an ongoing process and will continue in months to come. To tell if an item has a pdf you will see a pdf icon to the right side of the product listing. Click on it and the music will appear. These items are samples of a portion of the music and are blocked from printing as they are copyrighted material. As well, more sound samples are being added from the DESPUB Catalog as well as the Ken Bauer Productions Catalog. In addition, hundreds of sound files are now up in the Rich Heffler catalog with the solo products having been added as of late. Most all of the Heffler arrangements are now up with sound files. Another area that is being added with sound files are the American Ensemble Series for the Salvation Army. As you can see we are adding more support to the nearly 6,000 items that we catalog. Although not on our sites, the ePrint division of www.jwpepper.com has recently posted more of the DESPUB offerings. You will find that some of our other prime dealers have added graphics and sound files of our products as well. You can check these out on www.despub.com under the "dealer List" on the menu bar. There are new items in the 2008 Catalog that are now available... from Ken Bauer Productions are: Still, Still, Still as a clarinet solo (KBP0293), trumpet solo (KBP0294), and trombone solo (KBP0289); What Child Is This? as a trumpet solo (KBP0292), and violin solo (KBP0292); I Know That My Redeemer Lives as a horn solo (KBP0301); Joy To The World as a woodwind quintet (KBP0288); Here We Come A-Caroling as a brass trio (KBP0298); O Come All Ye Faithful as a brass trio (KBP0299); Jesus Christ Is Risen Today as a mixed trio (KBP0282); Leaning On The Everlasting Arms as a mixed trio (KBP0281) and brass quartet (KBP0270); and, Silent Night as a brass quartet (KBP0273). From DESPUB: by Billy Madison, At The Cross as a solo—flute (110157), oboe (112131), bassoon (116108), clarinet (118148), alto sax (124146), tenor sax (126135), trumpet (135143), horn (137126), trombone (139137), tuba (143132), mallet (150110), violin (161144), viola (163120), and cello (165121); and Hallelujah Side a snare drum solo (150110). By Dana F. Everson: Follow On as a flute quartet (110412); Brethren We Have Come To Worship as a woodwind quintet (130514), My Faith Has Found A Resting Place as a brass quartet (145442); America, America as a brass quintet/sextet (145549); and, There Is A Fountain as a brass quintet (14550). And by David Phil Norris: Fanfare On Alleluias as a brass trio (145313). As we come into this Easter season it behooves us, as Christians, to be reminded of the importance of our celebration. Our faith in Christ who has been resurrected is what makes our creed distinctive. When we started publishing 25 years ago we didn't have Christmas music in our catalog and when questioned why not, we stated that most publishers—sacred or secular—had Christmas music so that area was covered. We were urged to place music from our perspective which we have now done and on www.churchmusic.biz we list about 1000 Christmas items. Many dealers have expressed their thanks for our having Christmas music of substance to place in their stores. The point is, that we now have about 500 items for Easter and some dealers have expressed that we are one of the few resources for them to get Easter instrumental arrangements. When we get down to it, Christ The Lord Is Risen Today should be more important for us to express our faith than Jingle Bells. While Christmas music will continue to flood the marketplace, we are making a concerted effort to get more and more Easter arrangements into our offerings. Part of the problem is that there simply are not as many hymn tunes for Easter from which to draw as there are for Christmas. We continue to work on some editions given to Easter in our mix-n-match offerings. Lastly, we receive submissions all the time (which we can never keep up with) from all over the world. Needless to say, they range from quite primitive to wonderfully eloquent. As is stated in our Writer Submission Guidelines (which can be found on www.despub.com under "About Us") we do require new writers to give us a statement of their Christian faith and their involvement with church and/or Christian ministry before a contract is let. It was encouraging to see such profound statements made by the newest writer in our Catalog, David Philip Norris, in the acceptance of his eloquent rendition of "Fanfare on Alleluias", both in his Christian testimony and Ministry Involvement. The latter portion of his Ministry Involvement bears sharing for it relates to the reason why we do what we do... "For centuries the Church was the source of great Art in the Western world, but many Christian artists today have given Christians in the Arts (of any medium) a bad name to the point where the term "Christian art" is now equated with poor and shoddy workmanship. (How does that fulfill the words of the Psalmist when he commanded us to "play skillfully on the strings"?) My hope with this group is to eventually see a renaissance of sorts take place, recruiting artists... to write and create new works that are equal of surpassing quality to what is being produced by the secular community." There are several important things to consider having to do with brass intonation and tuning. In performance the factors I’m about to describe come into play. Whether you react to these things instinctively or consciously, having some awareness of them will help toward best tuning. First, we all know that temperature affects pitch. The colder the temperature, the lower the pitch will sound. So, if the room is cold AND you sit idle for some period of time, without keeping the instrument warm, the next entrance will be flat. For valve instruments, this means blowing warm air through the entire tubing, putting down ALL the valves as you blow the warm air through the instrument. If possible, covering the bell with the hand or a cloth will speed up the warming process. But, with this comes one additional hazard: water condensation. So, if you’re blowing warm air through the instrument for a minute, before you play again, you should check for water build-up. Second, for trumpets and horns where the tuning slide comes off the lead pipe, the more you pull the tuning slide, the more the instrument goes out of tune with itself. Instruments are made to length so that, with the main tuning slide pulled a small amount (about 1/2” on trumpets), second-space A will sound about 440Hz. So, if you find that you are pulling the slide more, this may be an indication that you’ve got some tightness in tone or unnecessary compression of blowing that is causing the pitch to be sharp. The solution for tightness of tone would involve opening the jaw or oral cavity more; for breath compression, substituting quantity of breath for pressures of breath, similar to blowing out candles or letting out a large sigh. Third, in three-valve brasses, the combinations: 1-2, 1-3 and 1-2-3 are progressively sharp in pitch. On trumpets the 1-2 can be blown or lipped down; sometimes the 3rd valve alone can substitute for 1-2 (on all brasses, not just trumpets). For 1-3 and 1-2-3 on trumpet, the third or first valve slides are added to bring the pitch down. For horns, these sharp fingerings can be brought down through a combination of embouchure, blowing and right hand positioning. In baritones and tuba, the mouth/jaw position can be used to lower the pitch; if a 4th valve exists, this can be used to fix sharpness of pitch. On trumpets, 4th line D is flat for most situations except when playing the 3rd of a (written) Bb major chord. This same partial, concert middle C on baritone and the C below for tuba) is similarly flat. The best way to deal with this note is to lip it up and adjust the blowing a little faster within the written dynamic. I don’t recommend using 1-3 with slide (on trumpet) because of the very different timbre this length of tubing produces, but it’s not out of the question if that note is particularly low on your instrument. The trumpet G at the top of the staff, and on some instruments the F just below this, is sharp. The correction lies with maintaining enough space in the oral cavity and more pucker to the embouchure. As with the D, some players may use 1-3 with the slide, but this usually reduces control of the pitch since the neighboring F and A can also be played using 1-3.
http://yeodoug.com/resources/faq/faq_text/slidechart.html. His chart indicates the relative slide position to use for each note (e.g. f3 or -3 would mean a slightly lower 3rd position; +4 or #4 would mean a slightly higher 4th position). I should comment on the use of electronic tuners. Tuners are useful tools IF they help us develop our ears. If we simply move the tuning indicator to its in-tune position, we probably won’t improve our listening skills. An helpful use of tuners is achieved when we close our eyes (or look away), play with our best tone and THEN look at the tuner. When we look as we play, it’s likely that we will adjust the pitch visually to the tuner reference. If your tuner plays a pitch, it can become a useful tool in matching its pitch. When tuning with a piano for performance, play your note FIRST, then have the piano note played. This will avoid the tendency to make adjustments to a source pitch rather than playing the pitch where the instrument best tone and pitch center rests. Finally, there are issues concerning the direction from which a note is approached. On brasses, if a note is approached from a lower pitch, the higher note will tend to be flat. The reverse is also the case: when moving to a lower note from a higher, the lower note will tend to be sharp, because the player tendency is to not loosen the lip enough for the lower pitch. The wider the interval skip from note to note, the more pronounced the intonation error will tend to be. The tuner can be a helpful tool, but we must play the interval first without looking and then look at the tuner once the note is out. Brass playing is so very similar to singing in that every note must be tuned in the course of a phrase. Being aware of these factors of temperature, instrument acoustics and performance tendencies will clearly help toward better tuning. Look at the words. What mental pictures do they paint? Do they call for a heavy, accented atmosphere? Do they invite a lighter, breezier sound? What is the general mood? Look at the melodic line. Are there lots of leaps? Is it mostly conjunct motion? What instrumental range or other technical limitations are suggested? Look at the tessitura and the key possibilities. What special effects might be appropriate? Sometimes a brass mute can create a whole new timbre to add contrast and interest. Balance the colors and style of any accompaniment. For example, if the piano is playing a moderately percussive background, determine if the solo instrument would be most appropriate in a contrasting or a similar style. Sometimes the contrast is what is needed, again, always considering the words of a particular stanza. Although one of the exciting challenges of arranging is to take a tune that does NOT naturally lend itself to a certain instrument and then write around the limitations with creativity and cleverness, most of the time you will want to write idiomatically. Brass tend to be heroic and commanding. Woodwinds tend to be more personal and delicate. Strings are sovereign. By starting out thinking “safely” you will at least become aware of the technical hurdles with which you will have to deal if you decide to launch out with a choice that doesn’t naturally fit a particular instrument or ensemble. Keeping these considerations in mind will give your TUNE the best oppor-TUNE-ity for successful musical expression and ministry. Dana F. Everson holds the BME and Master’s in Saxophone Performance degrees from Michigan State University, and a Master of Sacred Music from Pensacola Christian College. Everson has also completed all the requirements for a doctorate and will receive it this Spring. He has over 300 published works. My name is Mildred Hondorf. I am a former elementary school music teacher from Des Moines, Iowa. I've always supplemented my income by teaching piano lessons—something I've done for over 30 years. Over the years I found that children have many levels of musical ability. I've never had the pleasure of having a protégé though I have taught some talented students. However I've also had my share of what I call "musically challenged" pupils. One such student was Robby. Robby was 11 years old when his mother (a single mom) dropped him off for his first piano lesson. I prefer that students (especially boys!) begin at an earlier age, which I explained to Robby. But Robby said that it had always been his mother's dream to hear him play the piano. So I took him as a student. Over the months he tried and tried while I listened and cringed and tried to encourage him. At the end of each weekly lesson he'd always say, "My mom's going to hear me play some day." But it seemed hopeless. He just did not have any inborn ability. I only knew his mother from a distance as she dropped Robby off or waited in her aged car to pick him up. She always waved and smiled but never stopped in. Then one day Robby stopped coming to our lessons. I thought about calling him but assumed because of his lack of ability, that he had decided to pursue something else. I also was glad that he stopped coming. He was a bad advertisement for my teaching! Several weeks later I mailed to the student's homes a flyer on the upcoming recital. To my surprise Robby (who received a flyer) asked me if he could be in the recital. I told him that the recital was for current pupils and because he had dropped out he really did not qualify. He said that his mother had been sick and unable to take him to piano lessons but he was still practicing. "Miss Hondorf . . . I've just got to play!" he insisted. I don't know what led me to allow him to play in the recital. Maybe it was his persistence or maybe it was something inside of me saying that it would be all right. The night for the recital came. The high school gymnasium was packed with parents, friends and relatives. I put Robby up last in the program before I was to come up and thank all the students and play a finishing piece. I thought that any damage he could do would come at the end of the program and I could always salvage his poor performance through my "curtain closer." Well the recital went off without a hitch. The students had been practicing and it showed. Then Robby came up on stage. His clothes were wrinkled and his hair looked like he'd run an egg-beater through it. "Why didn't he dress up like the other students?" I thought. "Why didn't his mother at least make him comb his hair for this special night?" Robby pulled out the piano bench and he began. I was surprised when he announced that he had chosen Mozart's Concerto #21 in C Major. I was not prepared for what I heard next. His fingers were light on the keys, they even danced nimbly on the ivories. He went from pianissimo to fortissimo . . . from allegro to virtuoso. His suspended chords that Mozart demands were magnificent! Never had I heard Mozart played so well by a person his age. After six and a half minutes he ended in a grand crescendo and everyone was on their feet in wild applause. Overcome and in tears I ran up on stage and put my arms around Robby in joy "I've never heard you play like that Robby! How'd you do it?" Through the microphone Robby explained: "Well Miss Hondorf . . remember I told you my mom was sick? Well actually she had cancer and passed away this morning. And well . . . . she was born deaf so tonight was the first time she ever heard me play. I wanted to make it special." There wasn't a dry eye in the house that evening. As the people from Social Services led Robby from the stage to be placed into foster care, I noticed that even their eyes were red and puffy and I thought to myself how much richer my life had been for taking Robby as my pupil. No, I've never had a protégé, but that night I became a protégé . . . of Robby's. He was the teacher and I was the pupil for it is he that taught me the meaning of perseverance and love and believing in yourself and maybe even taking a chance on someone and you don't know why. Robby was killed in the senseless bombing of the Alfred P. Murrah Federal Building in Oklahoma City in April of 1995, where he was reportedly . . . . playing the piano. We all have opportunities each day to help realize God's plan. So many seemingly trivial interactions between two people present us with a choice: Do we pass along a spark of the Divine? Or do we pass up that opportunity and leave the world a bit colder in the process? The set-up of the percussion section of the band or orchestra requires a little pre-planning. Since there are a variety of instrument combinations possible, depending on the music to be performed, the instruments may be placed in different locations for different performances. Here are a few basic concepts that should be applied when determining the set-up. First, try to keep the instruments as close together as possible. If they are spread too widely it could make it difficult for the players to stay together rhythmically. This could also create a problem for the players as they switch instruments during a piece because there is frequently very little time allowed to make the change. These changes will also be the determining factor in where each instrument should be placed. Try to keep the movement of the players to a minimum to make it easier on them and to decrease the distraction to the audience. Second, center the instruments with the ensemble. The percussion section should provide rhythmic stability for the other players and placing the instruments in the center, as opposed to the left side or right side, will help accomplish this. Traditionally, the bass drum is in the very center and the other instruments are spread out on either side of it. The timpani should also be placed as close to the center as possible. 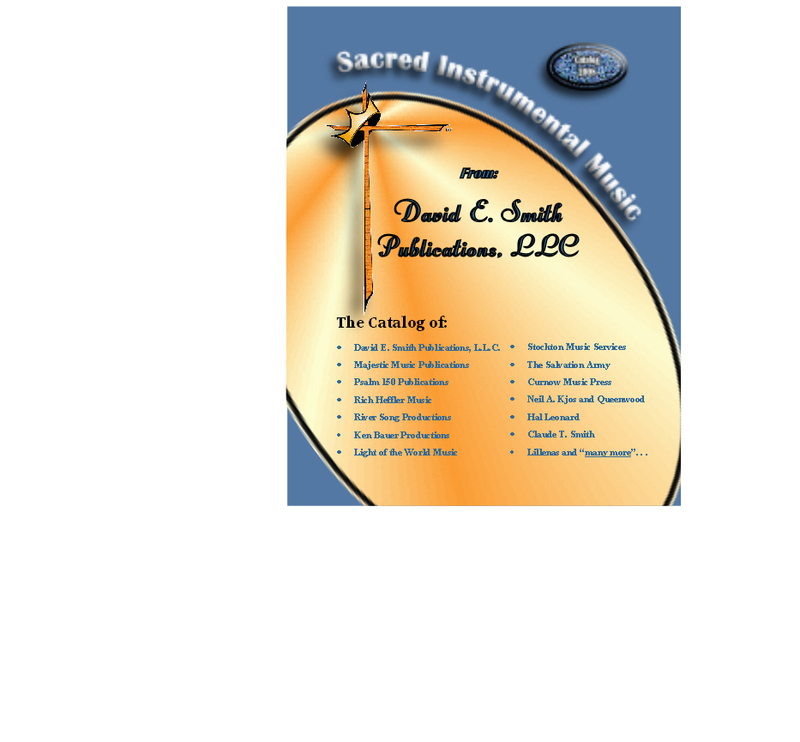 The keyboard percussion instruments are frequently placed together to the outside of the section, but this is not mandatory and they may be mixed in with the other instruments as required by the part assignments. It is always vital that each player watch the conductor in order to be able to follow his direction. If an instrument is angled even just a little in the wrong direction it can make it difficult to properly keep an eye on the baton. This problem will frequently cause performers (especially young, inexperienced students) to not even attempt to look up because when they do they are looking in the wrong place and therefore see no reason to try and watch. Setting the instruments at the proper angle will help alleviate this problem. Even though these suggestions might seem obvious it is amazing how frequently they are overlooked. It could be because the director is too busy to deal with these details personally or because the players are unaware of how to properly set up the section. Whatever the reason, following these few simple suggestions could help avoid a lot of problems during rehearsal and performance. … At some point in history owners of factories and mines began thinking of ways to keep their employees happy after working hours. There were no radios, televisions, high school, college or professional sports, and precious few sources of entertainment. The idea of amateur music making had been around for a long time, but there had been very little reason to organize it beyond the realm of leisure. The exact moment when a decision was made to mobilize it is not known, but sometime during the mid-nineteenth century several industries started bands—resident music groups that would both entertain the work force and help keep the employees out of trouble. In the early days of sponsored bands it was expected that all the players would hold jobs in the firm that gave the band its name. The most successful brass group of all is the Black Dyke Mills Band (see above) representing the John Foster clothing company—not unlike the American Burlington Mills. Early in the band’s history all the men were involved in manufacturing clothing, but such is no longer the case. In fact, there is a very good chance that none of the present players would know how to operate a loom—alas, even a needle—if given the opportunity. The relationship between band and company is now only one of name and, to an incidental degree, sponsorship. There have been, however, some notable exceptions. For example, once the Leyland Vehicles Band made an extensive tour of Japan, and the Grimethorpe Colliery Band concertized for over a month in Australia. In each case, the members—who made their living building cars and mining coal—actually received their regular salaries while touring with their respective bands. Such democracy, at least for the championship-section bands, continues to be limited along lines of gender. And yes, there are bands made up primarily of women. It is understood that teaching music in school or studio does not count as playing professionally. Also, the rule does not apply to conductors, so it is possible—and common at the championship section—for conductors to make a rather respectable living in this otherwise amateur environment. After having exposed that one “Achilles’ heel,” it might be well also to examine other “shades of gray” separating the absolute “black” of amateurism with the absolute “white” of full-time professionalism. In the British groups there runs quite a gamut. In July of 1981, at the World Association of Symphonic Bands and Ensembles in Manchester, there was one momentous concert that served literally as a “window dressing” for the British Brass Bands for representatives from all over the world. The concert was considered by most in attendance as one of the most memorable occasions of a power-packed week, and even though the audience was receptive, to the point of riotous clamor, few realized the events that had led up to the evening. That performance, which for most foreigners in attendance will eternally represent the sum total of the British Brass Band movement, was played by one of Britain’s most historic, successful, and entertaining bands. Including encores it lasted a full 2 ½ hours, and for it the band received the princely sum of approximately $300 American (give or take a few shillings. ), an amount less than what a conductor would ordinarily make for an outdoor Sunday afternoon park concert. “Brass band has vacancies for Cornet, or Any Brass Instrumentalists. Job vacancies: General Machinists, Plater/Welder, Diesel Mechanic, Autobody repairman, Stockroom man for Ford dealership, Cabinet-maker/Carpenter/Joiner for custom shop. Because “salary” is a non-entity, the bands try to provide most expenses for the players. Companies sponsoring bands usually pr ovide for such needs. Some of the bands pass the hat during the Christmas season and Sunday afternoon park concerts, and municipalities still include certain amounts in their yearly budgets. One source of income is sales of recordings. Some of the most successful bands—Black Dyke Mills, Brighouse & Rastrick, GUS Footwear, Hammonds Sauce, Besses O’ Th’ Barn, Grimethorpe Colliery—have many CDs available for purchase. Promises are never made, but at the end of the year, when the books are balanced, if there happens to be an amount left in the plus column, the bookkeeper can be instructed to disperse the remaining funds equally among the players. Sitting in a recital I am enthralled with the Beethoven violin sonata the students are playing. The intonation is solid. The musicality and phrasing are impeccable. The ensemble and balance between the piano and violin are excellent. The performers reach the end of the piece and the audience breaks into thunderous applause. The performers look sheepish, nod haphazardly to the audience, collect their music and shuffle off the stage. How rude! How unmannerly! How typical! The audience should be acknowledged before each bow. The performer should look directly at the audience, engaging the crowd for a full second and then bow from the waist to approximately a 45 degree angle. At the completion of a bow the performer should again look directly at the audience before moving, tuning or continuing with the recital. Bows should be made from the waist with the face looking at the floor, not grinning at the audience! Think “thank you for coming to hear this recital.” The bow is the performer’s way of graciously saying “thank you” to the audience. A bow that is too fast or not deep enough comes across as self-conscious rather than grateful. Bows should not include placing one arm across the waist! This is cute and appropriate for a Suzuki student recital, not for a high school, college or professional recital. Bows should be made with the instrument held comfortably without making the recitalist look or feel awkward. The performer should take care of the needs of his audience before taking care of his own needs. Bow before placing music on or taking it off the music stand. The quartet bows together as co-equal performers of chamber music. A sonata also dictates that both performers bow together. The keyboard performer should step into place in the same plane as the instrumentalist to take a bow. The instrumentalist should not acknowledge the keyboard player (as would be appropriate for a solo piece) but wait until he or she is ready to bow and take the bow together on cue from the instrumentalist. For a solo piece the recitalist should acknowledge the accompanist by extending the right hand and arm fully towards the pianist in a natural gesture that expresses gratitude for his or her investment of time and talent towards the success of the recital. When a piano trio, string quartet or other small ensemble takes a bow the group should stand so that the audience can see all the members of the group. This necessitates practicing the bows before the recital so that each person knows exactly where to stand in relation to his chair. For a string quartet the two performers closest to the front will stand to the left or right side of their chairs. The two performers in the middle will stand in front of their chairs. A performer should avoid turning his back to the audience while tuning. Keep “open” to the audience by standing near the pianist slightly away from center stage and tuning with the body at a 45 degree angle to the audience. Take time to tune accurately. Under the pressure of tuning in front of an audience performers often tune quickly and carelessly. The audience would much rather hear music played in tune! Walk briskly and confidently on and off the stage. The audience is quick to pick up on an entrance or exit that is slow or tentative, which reads to those who have come to hear you, “I am nervous and scared to death!” While this may well be true it is up to us as performers to help our audience not to feel uncomfortable with our body language. For solos some instrumentalists prefer to stand closer to the bend in a grand piano. For sonatas instrumentalists usually prefer to stand closer to their keyboard collaborator in front of the flat side of a grand piano. Facial expressions should express gratitude. Smile and show your teeth as you smile! Jay-Martin Pinner is a member of the string faculty at Bob Jones University in Greenville, SC, where he has taught violin, viola and double bass for 30 years. He also teaches classes in String Literature and String Pedagogy, and conducts the BJU Symphony Orchestra. Dianne Pinner is also a member of the string faculty at BJU. She has taught violin and viola for 30 years. She also teaches String Pedagogy and is a frequent performer as soloist, chamber musician and orchestra member.